Sheet pan dinners are the latest “one pot/pan” trend to sweep the interwebs, so who am I not to participate?? 😛 I like the concept and always hop on the latest food bandwagon, so I gave it a try and decided to make my first attempt somewhat fall themed. I actually did give this dish more thought than it seems. Most of that time was pondering how much of a head start to give the sweet potatoes. I bought the largest sweet potato I’ve ever seen and figured I better slice it very thin if there’s a hope in hell of making this sheet pan dinner anything resembling fast, so I whipped out my trusty mandoline. I gave the sweet potatoes a 15 minute head start, which worked out perfectly. I then added the asparagus, salmon, and maple syrup, and dinner was served 15 minutes later. I never eat salmon without involving lemon somehow, so I squeezed it on after everything was done baking. You can leave it out, but I won’t ever do that, it seems. I ended up drizzling maple syrup over the sweet potatoes and asparagus as well, and everything tasted great. Of course the sweet potatoes are already sweet, so don’t overdo it if you don’t like that sort of thing. Just a note on sweet potatoes – you may find them labeled as yams. I did. I’m not quite sure why the term is used interchangeably, but such is life. More often than not, the “yam” you’re buying is actually a sweet potato, and that’s fine. Have you tried making a sheet pan meal? Preheat oven to 425F, and move the rack to the top third of the oven. Line a baking sheet with foil for easy clean-up. Using a mandoline, slice the sweet potato into even slices (I used the 4 mm setting). Snap or cut the ends off the asparagus. 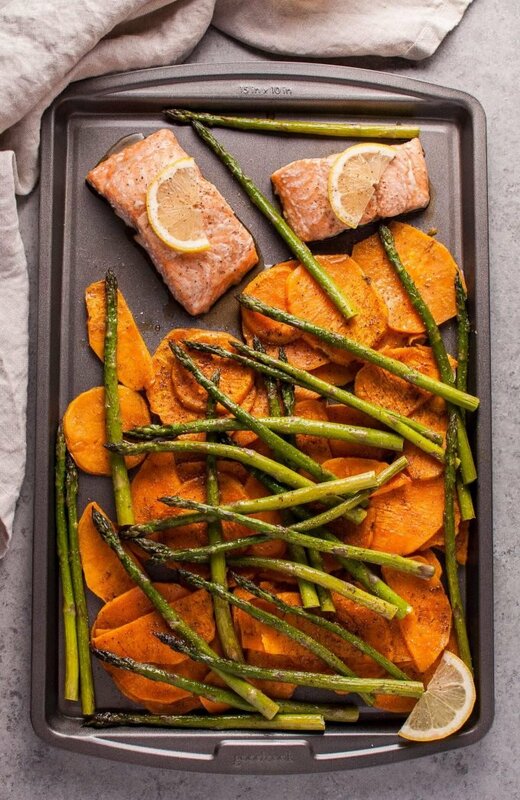 Place the sweet potato slices, asparagus, and salmon on the baking sheet. Coat everything with the garlic powder, salt & pepper, and olive oil. Add the salmon and asparagus to a plate and set aside. Spread the sweet potato slices as evenly as possible (some overlap is ok) on the baking sheet. Bake for 15 minutes. Add the salmon and the asparagus to the baking sheet (I added the asparagus on top of the sweet potato slices and cleared some space for the salmon). Coat the salmon with a tablespoon of maple syrup. If desired, drizzle a second tablespoon of maple syrup across the sweet potatoes and/or asparagus as well. Bake for an additional 15 minutes, or until salmon is cooked. Serve immediately with some lemon juice squeezed over the fish if desired. Make me a sheet pan meal of just the sweet potatoes. Now. I made this for dinner tonight. Super easy and delicious. Even my picky husband said it’s a keeper. Great, I loved it! It seems crispy, is that really? It looks delicious! The salmon isn’t crispy, no.